In the middle of the town of Blue Ridge, right by the active train tracks that still flow through the center of town, this great brewpub stands as a benchmark for locals and tourist alike. This area is fairly small in size and is broken in half with a restaurant in the front, and a bar with a small stage for live music in the back. Unfortunately, after a flight of 4 of the 6 beers available, I was slightly disappointed: About an average list containing a blonde ale that was much too hazy, an IPA that was brown in color and lacked hop flavor, a triple which was hazy and under-carbonated, and finally, a mango-pineapple hefeweizen that was surprisingly amazing! While most of the beer was underwhelming, the food was on the opposite end of the spectrum. Trying to pick out which food to order was a challenge by itself, and when I eventually went with a hawaiian burger, it was cooked perfectly and just what my senses needed! I left the brewery that night with plans to return for lunch the next day to try another meal on their menu. Mango-Pineapple Hefeweizen - Easy choice with this golden, light bodied beer. Hefeweizens are not usually my first choice; however the distinguishing, yet not overpowering tropical fruit flavors added the balance and refreshing body and flavor that made this beer great! 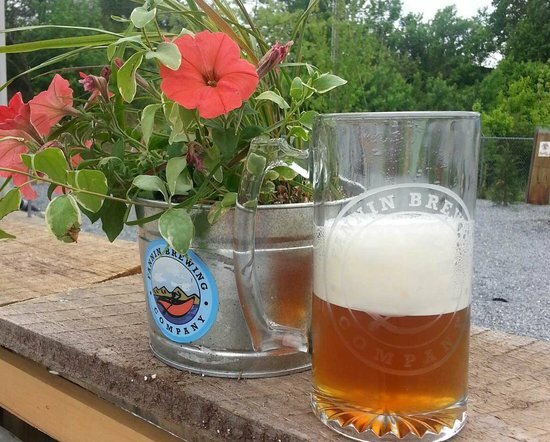 When I walked into Fannin Brewing Company, I felt something that I couldn’t initially place: Met at the front door by Tom, the owner and brewer, I wondered why the brewer himself was handing out pint glasses and tasting tickets. I reviewed the list of beers on tap, picked the first on the list, and looked around as I took in my surroundings: The brewing equipment hanging precisely on the walls, the locals drinking out their personally engraved steins, the BJCP faults list framed over the sink, and the beer…: I suddenly recognized the love, blood, sweat, and tears that must have created this place. As I went down the list, I tasted quite a few great beers. These were not your run-of-the-mill brews, but the definition of hand-crafted beer. I only had a few short minutes to speak with Tom, as he was fielding the many visitors as they walked through the gate, but I had a feeling that there were some truly difficult beers in front of me. I spoke with a number of out of town travelers who had heard of the beer and had come to see what it was all about. There are a few nice TVs and stools, as well as an outdoor area with live music for the good weather days. I’d recommend a visit, and expect to take away an increased appreciation for truly good beer. Black Bear Black Lager - This 5.7 ABV black beer tastes like a German lager gone to the Georgia mountains. With hints of vanilla behind vaguely roasted and chocolaty malts, this is an easy drinking dark brew that I could have several of while sitting on the porch, overlooking the Appalachian views! If you want a smooth, complex, German style beer, go to Fannin Brewing. If you want raw, American hops, with pale malts, and “imperial” in front of every name, go to Grumpy Old Men Brewing! It’s a small place, filled with loud laughter and high-pitch giggles. Walking into the brewery, you’re offered several different board games, a number of corn hole sets, outdoor and indoor seating, snacks, and lots of logo-covered paraphernalia. By calling themselves “grumpy old men,” these 2 brewers have set themselves up to do or say whatever they want (and they don’t hesitate to take advantage of it!). With 2 women's bathrooms inside, and a friendly notice telling men to find the porter john out back, these grumps have certainly set the tone for a few extra laughs. 11/2016 8 7 8 This is what you're looking for! Grasshoppa Imperial IPA - Very strong, yet perfectly balanced. While the strong hop aromas of citrus and pine collide, the flavor actually mellows the extreme bitterness that you would expect. Little to no warmth or astringency get in the way of this shockingly powerful and drinkable choice.